Salsa is a Caribbean music genre originating in Puerto Rico, Cuba, and New York City, but popular throughout Latin America and in the Caribbean particularly. Maduro launched the “Salsa Heart” initiative amid a wave of protests in 2017. “Venezuela is salsa territory and Salsa Heart is a great cultural movement through music to spread our Afro-Caribbean culture that we have in the neighborhoods, that belongs to the neighborhoods, and we will reach the depths of the neighborhoods at a national level,” Javier Key, the socialist official in charge of the program, is quoted as telling VTV. Maduro launched the initiative amid widespread protests in 2017 demanding an end to the socialist system that had left the country with minimal food and a totally depleted medicine supply. Maduro, who rose to power after the death of late dictator Hugo Chávez in 2013, spent much of his early tenure imprisoning, torturing, and killing protesters who demanded free and fair elections to replace Chávez. As hunger and illness escalated, Maduro turned to investing in distracting initiatives like the salsa program in an attempt to placate national anger, much of which is concentrated in universities and youth culture. At the time, food had become so scarce that 15 percent of Venezuelans were eating garbage to survive. Maduro placed full control of the food supply in the hands of the military, whose officials proceeded to demand bribes from civilians to access the food. Looting became a widespread alternative, so popular that police were arresting fellow officers for looting to survive. The situation has since dramatically worsened. Under President Juan Guaidó, however, the government of Venezuela acknowledges the humanitarian disaster that Maduro has created; Guaidó’s first act as president was to request food and medicine for the Venezuelan people. While Guaidó is the nation’s legitimate president, recognized by nearly 50 countries around the world, Maduro still inhabits the presidential palace and controls the military. This week, he ordered the military to blockade the road that connects Venezuela to Colombia to prevent American humanitarian aid from reaching the Venezuelan people. Maduro insisted in a speech that the aid is a trap intended to allow American soldiers to enter and invade the country. On Friday, Maduro released an open letter to the American people contending that all the evidence of a humanitarian disaster in Venezuela readily available in international media is a lie. Venezuelans on the Colombian border appear to disagree. Those gravitating towards the aid, many hoping to acquire necessary medicine for survival that is no longer available in any part of Venezuela, have begun protesting the regime and demanding access to the aid sent by the United States. 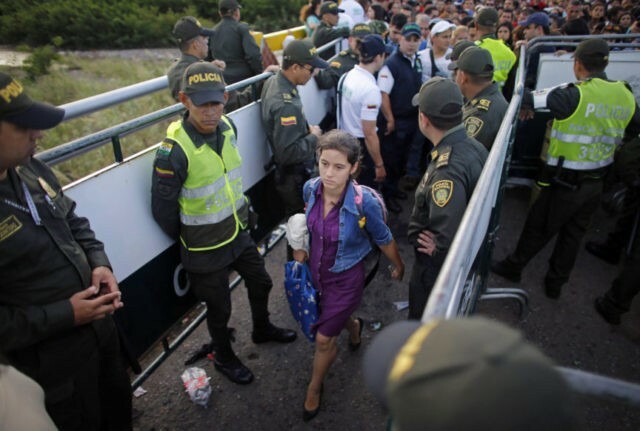 A group of young Venezuelans on the border demanded the aid enter on Thursday, carrying signs supporting Guaidó and referring to Maduro as a “murderer,” “usurper,” and “nefarious” ruler.